Integration of an individual production and resource planning solution. 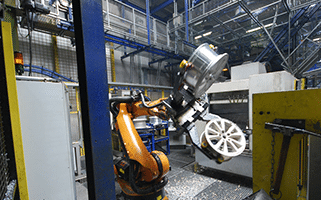 For over 20 years, the Ranshofen-based Borbet Austria GmbH has been manufacturing aluminium wheels for the European automotive industry. As a reputable manufacturer with an annual production of about 3 million wheels, the company is continuously substantiating its strong market position using efficient production processes. It is essential to maintain and consolidate international competitiveness with a high adherence to schedules, short delivery times and optimal utilization of production capacity. Especially for automotive industry suppliers, the increasing product diversity with ever more individualized production processes and required shorter lead times is a mounting challenge. Moreover, the growing wheel diversity and the increasingly smaller batch sizes make the planning of the production process increasingly complex for Borbet Austria GmbH as well. Core aspects of successful production planning include integrated lot size and sequence planning. Optimal lot sizes, associated support orders and machine-related job assignments for production lines are determined here. Despite everything, practically deployable software solutions are hardly available and usually provide unsatisfactory planning proposals, because of the complex requirements of today‘s economy. Consequently, Borbet Austria GmbH came into contact with the RISC Software GmbH, which was entrusted with the creation of an individual production planning software program. An individual development offers the possibility of ideal adaptation to the present production and manufacturing processes and the possibility of exactly mapping the machinery and shift calendar. RISC Software GmbH has now developed such customized planning software. By means of applied advanced mathematical optimization, this software makes optimal decisions on the sequence, set-up processes, timing and size of the machine assignment and production lots for the numerous orders. Among other things, the benefits of control through precise and deterministic mathematical algorithms can be measured in a relevant structuring and consistency of the planning results. The additional controllable adaptability enables an objective and rapid adaptation to new production scenarios. By having the growing complexity of the planning processes in grip and with calculated high quality production plans, the basis for a more cost-efficient production planning has been set.